The scrappy hexagon baby quilt inspired by Anna Maria Horner is finished! Hooray! I think this may be my favorite of the three crib quilts I have completed in the last couple of months. Measuring 33 1/2 x 38 3/4 inches, it is the smallest of the three, but it is definitely the prettiest. At the risk of sounding too proud of myself or whatnot, I did a damn good job with this one, and I love it. I really enjoy the palette I used and think it will work well for a boy or a girl. I took my time quilting it, having learned my lesson from the wonky cross quilt that sometimes it pays to make the extra effort and be patient with my machine and myself. I used a whole piece of Anna Maria Horner’s Folky Flannels for the back after Kelly turned me on to the line. I saw her working on this amazing baby quilt and fell in love with the prints and the textures. I figured using flannel for the backing would make the quilt extra-snuggly for the baby come those cold New England winters, and it would also be a nod to the person whose work inspired it in the first place. Ah, I do so love those mitered corners. It is always so immensely satisfying to stitch up that binding. Although, this morning, I had a dream that one of Matt’s friends was over and that he was asking me what I was working on. When I told him about binding the quilt, he said, “Oh, I know how to do this. My mother taught me how to do an invisible stitch because she was a quilter. Want me to finish that for you?” And I woke up as I yelled out a resounding, “YES!” Heh. I have to admit, I find this particular binding to be most satisfying now that it’s done. Whew! I’d say I’m done with the quilts for now. I’ll continue working on blocks and stuff, but nothing that requires me to get down on the floor any more until the Feisty one is here. Besides, all I really want to do is kick back and read for the next couple of weeks. I may just do that. Gah, what a beautiful quilt! I love it!! This is a really beautiful quilt. Awesome job! I'm sure the baby will treasure it. Beautiful! Any chance for a tutorial????? Seriously you're amazing! I can't get over all these beautiful things you're making. I think this is my fave so far too. Wow, it's gorgeous! You have every right to be proud. I absolutely love the colors of this one! You did an incredible job! 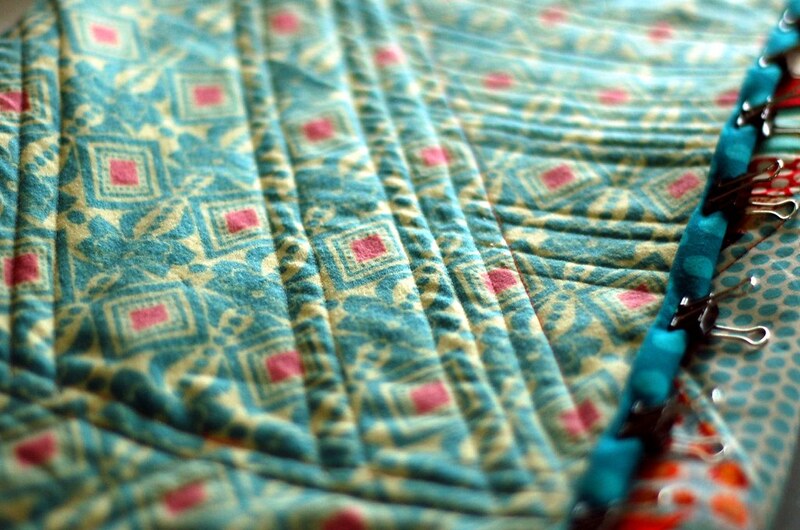 The quilt is gorgeous!